CJI understands the unique needs of local and state governments and public agencies. Opinion research provides an important tool in understanding the Civic Market. Unlike a commercial market, the Civic Market consists of the total public including both direct and indirect users of public services, all of whom help pay for public services. Much of what the local public sector provides is infrastructure used by all – Public safety, roads, water and other infrastructure. On the other hand, some elements of the local public sector include services used directly by only some members of the community. Public transit and public education are two of the most visible of such services. For example, public transit systems may be directly used by from 10% to 30% of a local population, but all citizens benefit from having such service available — although many are more likely to see the costs to them than the indirect benefit. The same is true of public education and other public services. CJI’s studies of Civic Markets include planning studies to measure citizen priorities, the extent of current and latent demand for direct use of services, and support for funding those services among citizens who do not directly utilize those services. We also study citizen satisfaction with public service. In addition, we examine the citizens themselves and how they choose to participate (or not) in the Civic Process. • We have aided transit authorities, cities, and county agencies in understanding their Civic Markets. • We have studied the voting process itself — attitudes toward the way the ways voters can cast ballots – at traditional precinct locations, by mail, at multiple centralized vote centers – and the likely effects of those systems on voter participation. 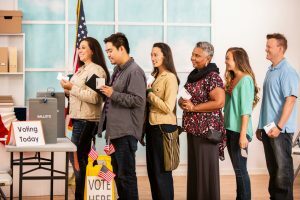 • We have studied the relationship of voter turnout to the success of ballot issues, especially tax issues, and strategies to deal with turnout fluctuations. • We have helped agencies understand priorities among potential service users and aspirations and concerns among taxpaying non-users and have developed research-based strategies to develop or maintain public support for agencies and their programs. Contact us. We will be happy to discuss your Civic Affairs research needs.